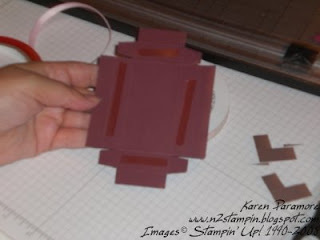 N2 Stampin': Nugget Box Tutorial and Blog Candy! So here is the post for the nugget candy box. The items shown to the left are what I used to create the box. I hope that you will be able to understand my tutorial. Refer to the pictures as you read the directions. Hopefully that will help you. Begin with a piece of card stock cut to 3 3/4" x 5 1/4". Score it at 1/2" on all four sides and then score it again at 1 1/8" on all four sides. Cut in to the score marks on the two longer sides leaving tabs as shown in the picture below. Be sure to trim tabs at an angle because this makes them easier to work with. You will have four tabs, two short ends and two longer ends when you are finished trimming your box base. To assemble it, apply Sticky Strip to the base as shown in the picture below. Fold tabs in and attach to the longer sides of the box base and fold all sides down on scored lines to be stuck on the sticky strip pieces. This will complete your box base. Cut a piece of card stock to 3 1/8" x 5 1/8". I used textured card stock for mine. Score this piece at 2 1/4" and then 4 1/2". Turn card stock piece around 180 degrees and score again at 2 1/4" and then 4 1/2". 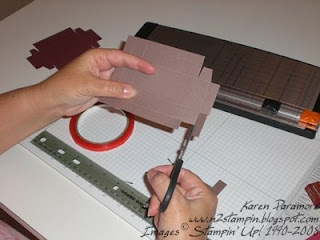 Adhere the designer paper piece that is cut 1 1/2" by 5 1/8" to the scored card stock piece. 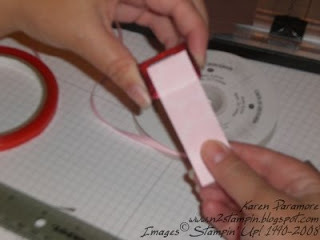 Using sticky strip, adhere one side flap to the other to create a rectangle shape open ended slider for your box base. Cover nugget candy with a piece of designer paper that measures 1" x 3 1/4". This box size will hold 3 nugget candies. Place the candies inside the box and slide the slider cover onto the box. To finish it tie with a piece of grosgrain ribbon. What a nice gift this is to make! It makes even simple chocolates seem so very special! Now onto more candy! I want to announce my very first blog candy give away! In honor of my site reaching 1000 hits and to thank you for your support, I want to have a very special drawing! To be entered into the drawing, please leave a comment on this post telling me what you like to use stamps for the best. 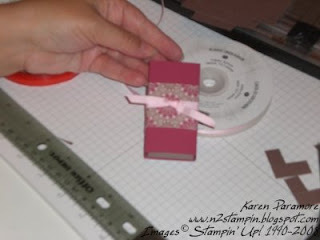 Is it for making cards, scrapbooking or making 3-D items like the nugget box I just showed you. In order to be considered in the drawing you must leave your complete name, where you are from and your email address on your comment. Please leave your comment by the deadline date of this Saturday August 9th. I will pick a lucky winner through random .org on Sunday afternoon, August 10th and will announce the winner in a post so be sure to check back. 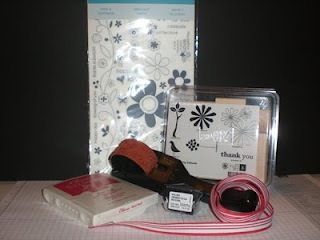 Below is a picture of the blog candy that you could win! This is over $50.00 worth of Stampin' Up! products! Can you say Whoo Hoo? Don't forget to leave your comment by Saturday night at midnight! Let me know what you thin about my first tutorial too! The nugget box was such an easy and fun project. Not sure if we liked making the box or eating the candy better!! 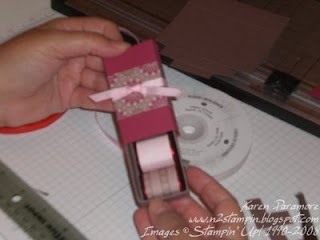 The nugget box was very fun and I'm so happy my stampin up demonstrator did all the scoring for me (SMILE). 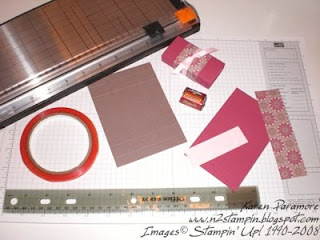 I love stamping things other than cards - note pads, journals, etc. Too cute! You are the most talented SU Demonstrator every! What fun it was at the Hostess Appreciation day!!! I'm just getting started and learning sooo much. The nugget box was such a neat ideal, what a great little gift for guest at a dinner party. Thank you karen for all your ideals. I love using my stamps for cards. I love making cards. P.S. Sorry I didn't follow instructions on my first comment. 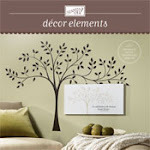 a great little gift for that special someone or to welcome a guest. I love to make cards and design baby books. Karen, I think your first tutorial is great and the instructions are easy to follow. Way to go! I'm sorry I missed the hostess appreciation party. It look like y'all had a blast. 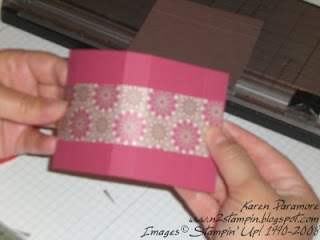 I really love to stamp 3D projects like boxes, tags, and bags -- all those little projects that are "different."